JailbreakMe 2.0 Star is the name! – The userland jailbreak for iPhone 4, iPhone 3GS, 3G on iOS 4 / 4.0.1, iPod touch on iOS 4, and iPad on iOS 3.2.1 is out !!. It is a browser based jailbreak, all you have to do is to browse to http://jailbreakme.com from your iOS device to jailbreak it. Servers are probably thrashed right now. Keep trying until you successfully load the page. We will be back with quick how-to guides soon. Stay tuned for that !! UPDATE 2: Early reports confirms that this new jailbreak is breaking FaceTime and MMS. We will let you know as soon as we have more on this. 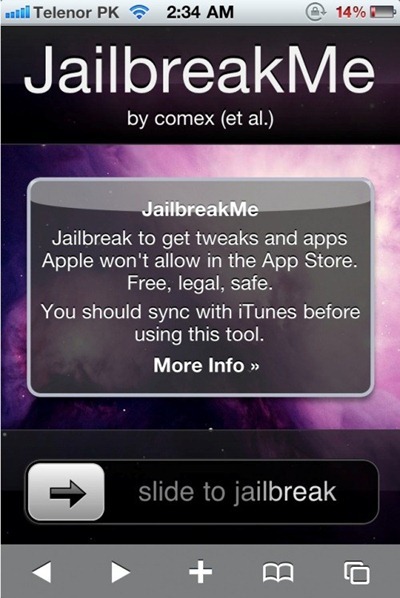 UPDATE 3: Complete How-to Guide to Jailbreak iPhone 4, iPhone 3GS (New Bootrom) with JailbreakMe 2.0 (Star) Is up! Follow all the instructions posted here. Unlock for iPhone 3GS/3G is also Live here! iPhone 4 users will have to wait for about 48 hours for the unlock. UPDATE 4: Complete How-to Guide to Jailbreak iPod touch 3G and iPod touch 2G MC Model with JailbreakMe 2.0 (Star) Is up! Follow all the instructions posted here. UPDATE 5: Complete How-to Guide to Jailbreak iPad WiFi and iPad 3G on iOS 3.2 / 3.2.1 is up! Follow all the instructions posted here. UPDATE 6: Those of you who are having problems with FaceTime and MMS should follow the steps posted here to fix the issue. UPDATE 7: Are you stuck on purple-colored space screen of JailbreakMe? Follow the instructions posted here to fix this problem. UPDATE 8: Fix PDF Exploit in Safari After Jailbreaking with JailbreakMe Using “PDF Loading Warner” app, guide for which is posted here. I downloaded “redsn0w_win_0.9.5b5-5” and tried to browse through both “iPhone2,1_4.0.2_8A400_Restore.ipsw” and “iPhone2,1_4.0_8A293_Restore.ipsw” separately. But eachtime its saying “Unable to recognise the specified ISPW”. Is there a way to “upgrade” a JB’en 3gs to 4.0.1 (from 3.1.3) even with iTunes pushing 4.0.2? I am attempting exactly that my pixie I’ll let you know in ten minutes how it goes!